Welcome to the new standard in automated checkout software for limited edition sneakers and clothing releases. CyberAIO has proven to be the fastest bot around. Leaving its competitors in the dust. Filled with release guides, set-up advice, resell predictions, monitors and much more. *£50 GBP every 6 months to keep your bot updated and to secure your place in the Discord server. First initial 6 months of updates provided free of charge. The logos above are property of the respected stores and are not affiliated or endorsed by CyberAIO. "The best AIO bot on the market hands down! The dev doesn't stop working to make the bot better and better!" "Very good bot, highly recommended"
"Great bot it is fast and copped so many sneakers with it!!" "This is the best bot I have ever used. It works amazing on Shopify, footsites and even supreme. Also Lucas is the best at answering questions and always provides fast support." "So far CyberAio has been great and will continue to grow. Keep up the great work." "CyberAIO cooks supreme hard , it's super fast on all the websites it runs. Helped me cop a bunch of blue tints. Dev is supportive and will help you out with any concerns or problems you have. If you get the opportunity to cop cyberAIO, do it." "Very interesting, and very clean UI, it has a user friendly interface, and also works on multiple websites, in my opinion it is one of the best bots for the money. 'The best bang for your buck'." "Great bot already easily paid for itself with several cops including yeezy"
"One of the hardest working dev that I've ever seen!" "Though I've spent little time with CyberAIO the customer service is top notch and the application is very user friendly. Looking forward to a upward 2018." "Great bot! I copped 7 Yeezys on the Blue Tint Drop!" "Cyber aio is the best shopify bot out there... and it also has supreme so you don't need another bot." "Best Supreme bot by far, constantly cooks week after week! ????" 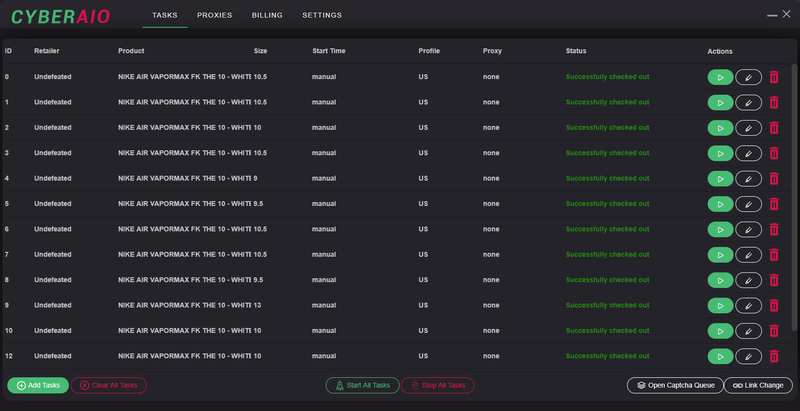 "Great Community and problems are fixed in short time"
"Best AIO bot out there! Must cop!" The product you are viewing is a piece of software designed to help increase your chances of purchasing limited edition sneakers and clothing from numerous sites listed on the home page. By purchasing CyberAIO you are accepting the terms and conditions, and you also understand that this software does not guarantee your future purchases from the listed sites, but it does drastically increase your chances.